With the 2012 English Poker Open down to the final 15 players, the money bubble has burst in this tournament. The top 15 players will share in a £276,000 prize pool, and the winner takes home a very large £78,660 payout. As Day 2 wound down, Jamie Roberts had the best shot at this prize since he’s leading the field with 674,200 chips. The Londoner will be hoping to add a big score to his career live tournament winnings of $178,494. 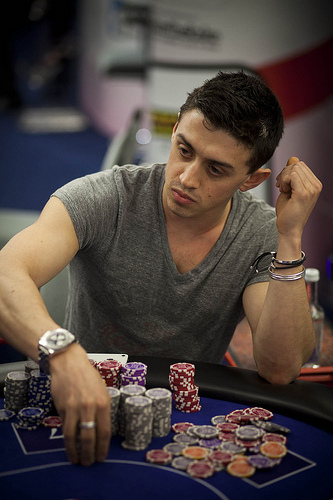 Rhys Jones (341,500 chips) is another player who’s run well throughout the second day. He’ll be looking to win his first live poker tournament and add to $143,228 in tourney earnings. 2012 EPT Copenhagen champion Mickey Petersen is also still alive in this tournament with 205,000 chips. The Dane has done very well in live events throughout his career having collected $748,171 in winnings. Home » Rakeback News » English Poker Open 2012 Enters the Money!